Marie Peters talked with her foster child, Noel, in the kitchen on Nov. 12. Marie and her husband Ron have been adopting and fostering children since the 1960s. The pictures along the back wall of their kitchen feature many of the almost 200 children they have fostered. Marie and Ron Peters have fostered 193 children over four decades. But Marie Peters said she’s never focused on the numbers. “It’s the years you’re committed to these children that matters,” she said. Marie Peters and her foster children, Noel and Mekhi, played after lunch before nap time on Nov. 12. Marie and her husband Ron have fostered nearly 200 children, and adopted five children, who are now grown. The Peterses, members of St. Joseph Parish in Manchester, became foster parents after they adopted five children through Catholic Charities of St. Louis years ago. Now in their 80s, they are caring for 2-year-old twins, Noel and Mekhi, who are in need of an adoptive family. A year ago, the couple met Christine Hendricks at Sacred Heart Parish in Valley Park at a Mass for families with special needs. 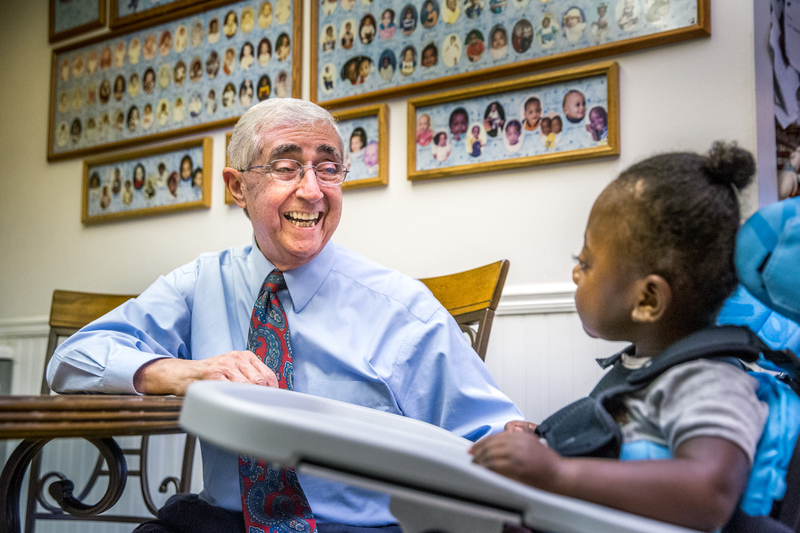 Hendricks, who leads the parish’s Respect Life committee, discovered they were foster parents and saw the potential for a deeper connection. As part of her work with the Respect Life committee, Hendricks invited the Fostering Faithful Families program to Sacred Heart several years ago. The program, coordinated by Catholic Charities’ Good Shepherd Children and Family Services, raises awareness of the needs of foster children and recruits new foster parents. The program identifies opportunities to support foster families, including providing respite care, donating gift cards or clothing for families and adopting foster families at the holidays. More than 13,000 children are in foster care in Missouri, according to the Missouri Department of Social Services, Children’s Division. Hendricks said the parish already had been raising awareness for several years about the need for foster families. She knew more could be done to be a support to families who foster all of these children. In February, Sacred Heart hosted an information night on foster care. That resulted in another connection. Tiffany Marquart, founder of the Valley Park Foster Closet, heard about the event on social media and contacted Hendricks. Marquart saw that as an opportunity to get the word out about her organization, which provides foster families in the area with free resources, such as clothing, diapers and other baby items. The Knights of Columbus at Sacred Heart donated money for shelving at the closet, and parishioners have volunteered there. Marie and Ron Peters have been fostering children since the 1960s. 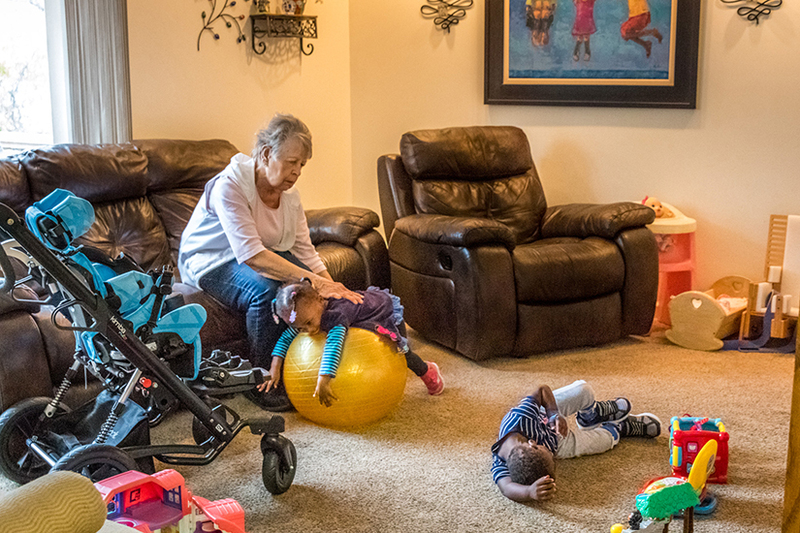 Now in their 80s, the couple are fostering twins with special needs. Ron smiled as he sat in the family kitchen with Mekhi. Photographs of the Peterses’ former foster kids are hung on the wall behind him. Taylor, of Fostering Faithful Families, said that children who come into foster care are usually there because of abuse or neglect. She works with more than two dozen parishes in the archdiocese, as well as more than 10 churches in other denominations, in raising awareness of the needs of children in the foster care system. Marie Peters and foster child, Noel, looked at snowflakes on Nov. 12. Marie and her husband Ron Peters are currently fostering twins Noel and Mekhi, and have fostered almost 200 children over the years. The twins are in need of an adoptive family. To learn more about becoming a foster parent, call Good Shepherd at (314) 854-5704. The Fostering Faithful Families program raises awareness of the needs of foster children and supports the families who care for them. The program, sponsored by Good Shepherd Children and Family Services, works with volunteer ambassadors to raise awareness among parishes in the archdiocese and identify opportunities to support foster families, including providing respite care, donating gift cards or clothing for families and adopting foster families at the holidays. For more information, call Cora Taylor at (314) 854-5716. Tiffany Marquart, founder of the Valley Park Foster Closet, sorted baby clothing Nov. 8. She started the closet to provide for the needs of foster families in the area. Parishioners at Sacred Heart in Valley Park have supported the closet by building shelves, volunteering time and donating items. As a foster parent, Tiffany Marquart knows how important it is to be ready at a moment’s notice. 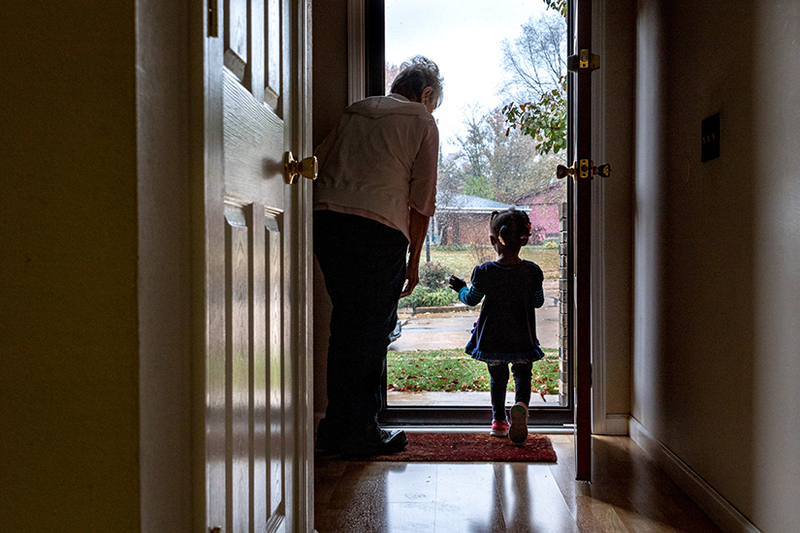 The phone call comes — a child needs to be temporarily separated from his or her family for a variety of reasons — and Marquart and her family step in to fill the gap, offering care for an extended period of time. Most foster families learn to keep a variety of clothing and other children’s necessities on hand. But sometimes they need other items with quick notice. 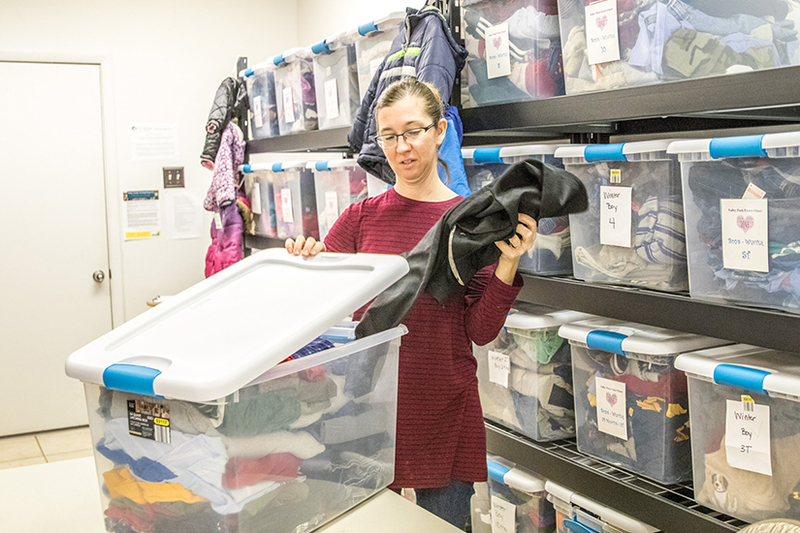 Almost a year ago, Marquart started the Valley Park Foster Closet to provide free resources to licensed foster families, including diapers, clothing and other baby and children’s items. The organization falls under the umbrella of One Heart Family Ministries, which trains families who care for children in foster care. Parishioners at Sacred Heart in Valley Park met Marquart at an information night on foster care that was hosted by the parish, and they jumped into gear with an offer of help. With support of the Knights of Columbus, they purchased storage bins and shelves for the closet and helped organize clothing. Other donations have come from members of the community. Marquart had seen similar efforts in other parts of St. Louis, but there was nothing this specific in the West County area, she said of the closet. She started by trading items with other foster families in the area; by January, a space was opened in a commercial building her husband owns in Valley Park. The closet is open on Tuesday and Thursday mornings, Sunday afternoons, or by appointment. Items most needed include disposable diapers, as well as baby gear in good and non-expired condition. Visit Valley Park Foster Closet on Facebook to learn more about the organization.